If you hate networking, it may be because you don’t want to feel as if you are only in it for what you can get from someone (a few people who do that very thing have given networking a bad name). The truth is that good networking isn’t about racking up a body count—it’s about building relationships. If some of these relationships turn into great friendships, that’s wonderful, but if most of them are simple friendly acquaintances, that’s great, too. When you think about networking, remember: not every meeting needs to have a goal. The important thing is to establish or refresh a connection. One of the things that may make you anxious about networking is the feeling that you have to talk to everyone in person. That’s not always true. Some of the most effective networking you can do is sending a regular email (or Facebook message or LinkedIn message) to everyone you know. Status updates won’t work—direct, purposeful contact is the key. It’s super-easy…every six months or so, send each person a quick email (or message) that says something like, “Hi, how are you? It’s been a while. I’m [wherever you are, doing whatever you’re doing]. If you need anything, give me a call. My phone number is ____. Feel free to pass it along if you know of someone I could assist. Keep in touch!” While it’s true that sending these messages and nourishing those connections does take time, it probably doesn’t take as much as you think. Think of the time you spend networking as an investment in your career success. You probably went to school to do your job, and maybe you’ve gone to continuing education classes in one form or another. Those things are investments, too. The investment you make in networking will pay off for you throughout your career in countless ways. Use these tips to make it a little easier. Discover more easy, valuable ways to network in Networking Effectively: How to Build Your Network for Career Success, available on Amazon. This post was originally published at an earlier date. Career Coach - Peggy McKee is an expert resource and a dedicated advocate for job seekers. 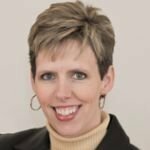 Known as the Sales Recruiter from Career Confidential, her years of experience as a nationally-known recruiter for sales and marketing jobs give her a unique perspective and advantage in developing the tools and strategies that help job seekers stand head and shoulders above the competition. Peggy has been named #1 on the list of the Top 25 Most Influential Online Recruiters by HR Examiner, and has been quoted in articles from CNN, CAP TODAY, Yahoo! HotJobs, and the Denver Examiner. Disclosure: This post is sponsored by a CAREEREALISM-approved expert. You can learn more about expert posts here.